A small number of tickets remain for the club's pre-match corporate lunch function before Saturday's big Danske Bank Premier League title showdown with Crusaders at Windsor Park. The event will be held in the Joe Bambrick Suite in the South Stand from 1.00 pm and the special guest speaker is former Rangers and England striker Mark Hateley. 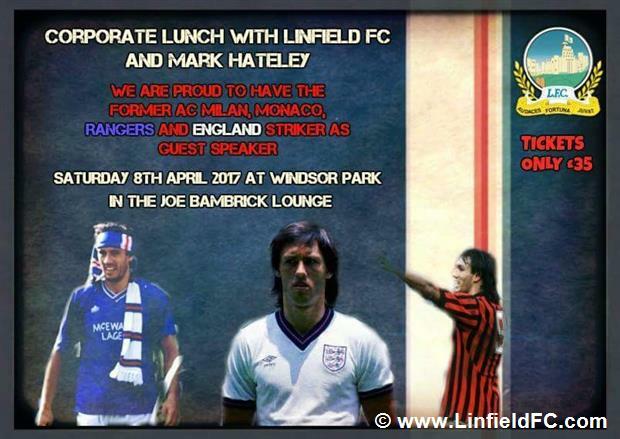 Tickets are available from Stephen McKernin (linfield1886@hotmail.com) or telephone 07505371252, priced at £35.00. This includes a three course lunch and corporate seat in the South Stand.